Early life: Though he was born in Maryland, Callahan's family spent a total of eight years living in Knaresborough in England's West Riding of Yorkshire, with a four year return to Maryland from 1969 to 1973. His parents worked as language analysts for the National Security Agency. ¶ He currently lives in Austin, Texas. 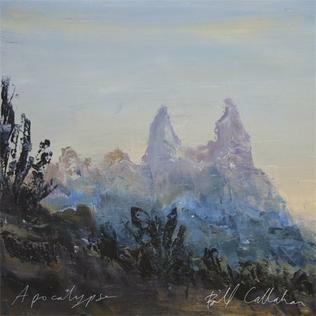 ¶ Apocalypse is Bill Callahan's best release in some while, sustaining a unity and intimacy of mood throughout. A Western song-cycle, it opens with Callahan as the "Drover", herding cattle and exulting in his "wild, wild country". ¶ In "Baby's Breath", a romance slowly sours over a Lightnin' Hopkins-style cyclical blues vamp. "America!" is an iconic-ironic celebration of the country of Callahan's dreams, protected by "Captain Kristofferson, Buck Sergeant Newbury, 'Leatherneck' Jones, Sergeant Cash – what an army!" This rustic, allegorical fantasia finds Callahan communing with buffalos and bees, then coming full circle to where he has "no more drovering to do". The songs are cemented together by modest arrangements of guitar, flute and piano, wielded like watercolours. ¶ Bill Callahan has been making records since 1990, when he tended to lay his hands on whatever plastic utensil or out of tune furniture was nearby and released the discordant mess under the moniker Smog. His later career has been marked by the addition of wry, observational lyrics – delivered in crystal clear baritone – and a seeming sense of structure. Since 2007 he's been releasing under his own name at a rate of almost one album a year and his 15th LP Apocalypse is out now. We caught up with him for a wee blether. ¶ Apocalypse, as an album title, sounds pretty foreboding. Is this title a comment on society as a whole, or does it refer to something more personal as suggested by One Fine Morning? ¶ Apocalypse is a state of mind. It can have positive connotations. The definition based on scriptures has tainted it and made it something to be afraid of. It can mean a revelation, a lifting of a curtain, seeing something in a new light. It does not have to be scary. ¶ It's difficult to tell if your new song America is meant to be hagiographic, or a deeply satirical sideswipe at the country in question. Our guess it that it appears to be both. Are we correct? ¶ An uncritical biography of Scotland would be called haggisography. You can use that one in your act! It is not at all a sideswipe nor is it satirical. It's just straightforward, factual. Observational. It is supposed to be the story of songwriters as a kind of armed forces, and it's all wrapped up in a song that sounds like missiles and bombs.